I love my wife however I also love my appendages, which is why I would never give the Joseph Joseph Elevate Carousel Gift Set as a gift. The multi-colour utensils look fantastic and are great to use, but giving a kitchen utensil to the wife or girlfriend is like signing your own death warrant. The kitchen utensil set comprises of 5 utensils: Solid Spoon, Slotted Spoon, Flexible Turner, Slotted Turner, Ladle, Spaghetti Server and a carousel storage stand. The utensils are dishwasher safe. The stand unit is sleek bright and stylish and is made from tough ABS plastic and has a non-slip rubber base. The soft-grip knob at the top of the stand rotates the unit so you can get to the tool you require. A few reviews on Amazon suggest that the utensils fall off the carousel easily. In our tests we have not come across this issue, except when the stand is knocked by accident. 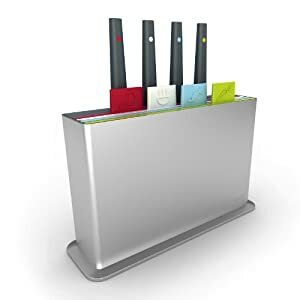 The stand looks attractive and will help you to stop cluttering your utensil drawer. Each tool has an weighted handle with an integrated tool rest, ensuring that, when an Elevate™ utensil is placed down, its head is always raised off of the work surface, however common sense should prevail as this can still cause items to drip onto the work surface. Why not brighten up your kitchen today with the Joseph Joseph Elevate Carousel Gift Set? They are great value for money, but try not to upset your better half!